India's largest e-commerce company Flipkart has a knack for springing surprises with bold, audacious moves. In 2010, when online payment gateways were still evolving and the Indian customer averse to transacting online, it embraced cash on delivery, a mode of payment that would soon emerge as the most preferred one in India. In fact, so steep were the dividends from the move that Aadhar architect and Infosys co-founder Nandan Nilekani remarked in one of his columns that it was singularly responsible for Flipkart’s take-off. Fast forward 10 years, the e-tailer has taken another leap of faith with a ‘buy now, pay later’ option. The feature is akin to a credit card, where a customer can make purchases on Flipkart throughout the month without having to pay for the products immediately. The outstanding bill can be paid by the 10th of next month. While not unheard of globally, the move is definitely a first in Indian e-commerce. The question is, can it prove to be a differentiator for Flipkart in its fight against Amazon? Is the user really looking for such credit lines? Is there too much risk in the risk-reward equation? “Companies like Paypal (Paypal Credit) , Alibaba (Ali credit), Klarna (Swedish e-commerce company) and JD.com have been offering this for several years,” says Sandy Shen, research director at Gartner. Clearly, then, it is a tried-and-tested method to stimulate purchases and drive up the average transaction value. And Flipkart is likely to gain, given it will be the first to offer such a scheme in India, Shen adds. Besides, it seems the online marketplace has carefully calibrated the timing of the move. The launch seems likely to coincide with the festive season, when e-tailers traditionally see a spike in volumes. Also, the pre-Goods and Services Tax (GST) clearance sale, where most online sellers are looking to liquidate inventory, gives Flipkart a good shot at testing the waters. Some experts feel the move is aimed at wresting customers away from competitors like Amazon. “In its current form, it is an attempt to drive customers towards Flipkart, in the hope of seeing a 10-20% rise in transactions. Besides, it could also be aimed at boosting average transaction values,” says Anup Jain, founder and managing partner at Redback Advisory Services. However, Jain adds the feature may not be sustainable in the long run and, if followed by other players, can cause additional credit burden for the industry. Experts are divided on whether this credit line for online purchases will get a warm reception. Shen believes the feature will benefit customers who either don't have a credit card or are wary of using it online. Jain agrees. “This can be an alternative for customers whose credit-settling cycle is planned around their salaries. For regular credit card users, it just provides extra credit,” he says. That said, in an age where lenders will go to any extent to extend credit, the option might just turn out to be yet another credit line for the consumer. “Today, most online shoppers have multiple credit cards and serious buyers might not actually find a genuine reason to use this option. Ideally, most consumers would want to aggregate their credit spend on fewer financial instruments for better monthly financial planning and expense tracking. Besides, there’s also the problem of trust and transparency, as to the presence of any hidden charges,” says Sanchit Vir Gogia, founder & CEO and chief analyst, Greyhound Research. Gogia also feels that Amazon is unlikely to follow suit as the Jeff Bezos-owned e-commerce behemoth will instead focus on promoting its wallet Amazon Pay. 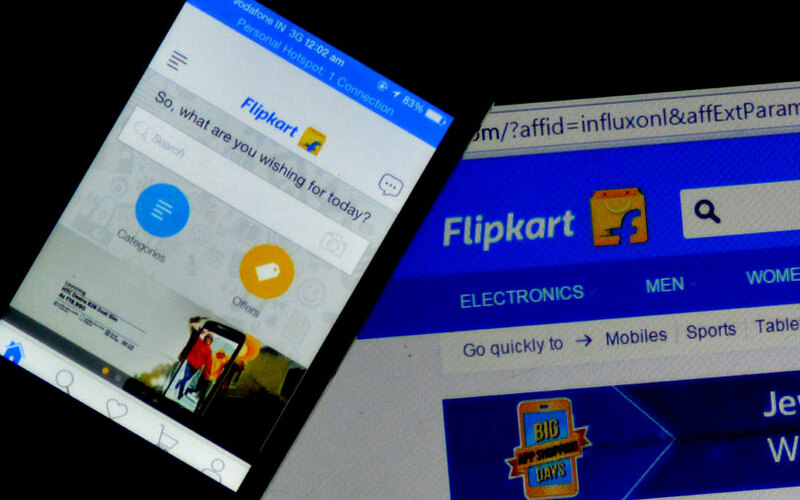 Defaults, especially the ones that are wilful, and recovery may prove tricky for Flipkart. Besides, regardless of the dues piling up with consumers, it will need to ensure that vendors’ payments do not get delayed. That is perhaps one of the reasons it has on-boarded only select sellers for the pilot. Gogia feels tying up with banks to mitigate default risks, and bringing in third-party financial entities will be key to the success of the feature. Even after all the due diligence by Flipkart, if it has plans for a larger commercial rollout of the feature, it has to tie up with third-party financial institutions like banks, multinational financial corporations such as Visa and MasterCard and insurers, adds Gogia. Some basic features might help it keep defaults in check, though. For example, an auto-debit option for settlement of dues from consenting customers could act as a layer of security. While Flipkart will levy penalties and suspend accounts of defaulters, it may still be easy for a user to create a new account and, using forged documents, pose as a different individual. Industry experts feel it will boil down to data and risk analytics, and a sound credit policy. “Flipkart should ensure that they make wise credit decisions, including identifying the right customer and the right credit limit, and develop and fine-tune their credit model to keep a low fraud rate. The data will also let them detect whether the customer is blacklisted and trying to create a new account,” Shen says. Shen adds that Flipkart is likely to have factored in such concerns, and is unlikely to offer the feature to those without historical data on the site. That means those with decent creditworthiness, a reliable payment record and netbanking or credit cards linked to their profiles are likely to be the first ones to avail of the feature. The move does have an element of risk, but it could fetch significant rewards. At the very least, it could prove to be another channel for the e-tailer to collect precious customer behaviour data, using which it can build a sound customer profile. Besides, there is a silver lining to defaults as well. Credit card companies, anyone? Says Shen: “It can bring additional revenue for Flipkart when a customer defaults (read: fine), or bring interest income should Flipkart start offering repayment through EMIs in future." Though only time will tell whether the move will pay off, one thing is certain—it won't go unnoticed by either Flipkart's users or rivals.